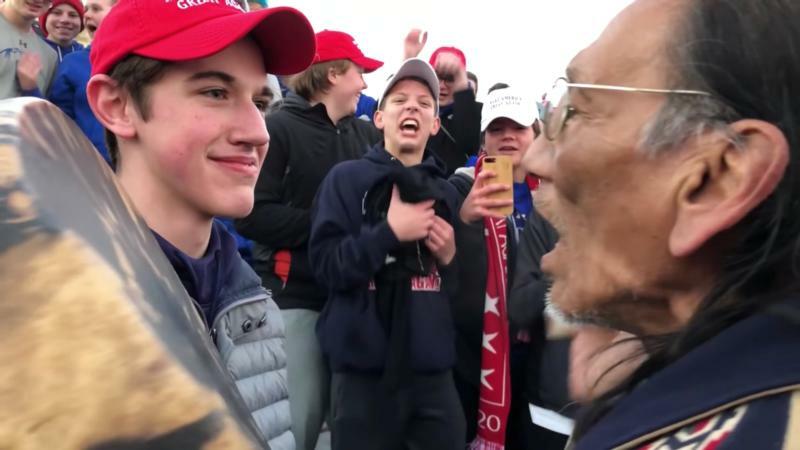 UPDATED – WASHINGTON (CNS) — Days after the now-famous exchange took place between Covington Catholic High School students and a Native American tribal leader in Washington, the Diocese of Covington, Kentucky, announced it would begin a third-party investigation into what happened at the foot of the Lincoln Memorial following the annual March for Life Jan. 18. Covington High School reopened Jan. 23 with police at the school entrance. The diocesan offices also reopened that day, but the building was evacuated that afternoon due to a suspicious package, which police and firefighters determined to be safe that evening. Phillips responded the next day to this interview, also on the “Today” show, and said he thought Sandmann’s remarks seemed “coached” and that he failed to take responsibility, but he said he took it to prayer and woke up the next day with a forgiving heart. I’m a practicing Catholic and conservative Republican. I’m also a retired all level administrator and teacher. Catholic schools are awesome and I was blessed to teach in one for a year, post retirement. I am wondering why, regarding the altercation with Native Americans and the Black hate group, that sponsors did not get involved immediately in the incident. If they had removed the students from the area, and I know they were waiting for the buses, things would not have escalated. I’m sorely disappointed that the sponsors didn’t do their jobs to protect the children;.they are still children. I’ve seen Twitter comments, and nothing but interviews of the students, but mo administrator has taken charge of this situation. Why isn’t the principal doing interviews on FOX news, or the Bishop on the news addressing the situation? No adult has stepped up to the plate. That saddens me! Admin needs to speak up! As a former principal, our District did not allow anyone to speak to reporters except the designated spokesperson, usually the principal or central office staff. Please do something about this to stop the negative press about the school and Catholics, in general. We must defend our children and our Catholic Faith. Please let this story end with sponsors at fault because they failed to protect the students. That is all, except don’t allow anymore students to speak because they aren’t official spokespersons.